Q: Do I need to use a special cable to plug in my Logjam stomper? A: No a standard guitar lead with a normal ¼” /6.35 mm jack (Phone) is all you need. Q: Will my Logjam stomper sound better through a PA or bass amp? 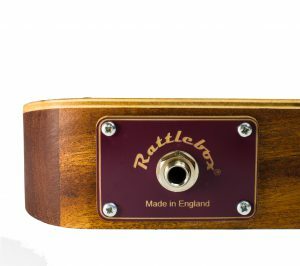 A: With the exception of the Rattlebox our stompers are designed to emulate a bass drum. Small speakers are not able to reproduce real bass frequencies so although our stompers will work when connected to smaller systems, they work best through a PA or bass amp. A tiny 15watt practice amp won’t cut the mustard! Q: How can I look after the finish of my Logjam stomper? A: Once the surface gets worn you can give the unit a light sand with some fine grade sandpaper, wipe off with white spirit and then apply some Linseed oil which is what we use to protect the natural wood. Q: I get a “popping sound” when I use my Logjam. Why doesn’t it sound bassy? A: Please check that you haven’t raised the input gain on your amp too high. This can trigger an overload which will make your unit sound too high-pitched. Q: Will my Logjam “feedback” at high level? A: No our units are not prone to feedback but it is advisable to keep your unit at some distance from a speaker (in the same way you would do with a guitar or microphone) when at high volume. Q: Are Logjam instruments environmentally friendly? A: Yes all our stompers are made from high- quality sustainable, certificated timber. Q: If my Logjam develops a fault will you help me? A: Yes we offer a very generous repair service. We always try to be helpful to anyone who has an interest in our products. Q: Do Logjam stompers use a piezo pick-up? A: No we don’t use piezos as they generally don’t sound that good and are not known for good longevity in this application.The capsules we use are all tested prior to leaving our workshops. Q: Do I need to use a preamp with a Logjam unit? A: No, it is not generally necessary to use a preamp. If we haven’t answered your questions then please use the contact form.